Here is the list of best free Epub to Mobi converter software for Windows. These software let you convert eBooks from Epub format to Mobi format. If you love reading eBooks on your device, then these Epub to Mobi converters will be beneficial for you. Besides Epub to Mobi conversion, some of these software can carry out conversions in formats other than Epub and Mobi. Some of these formats are PDF, DOCX, TXT, FB2, HTML, RTF, ODT, PML, SNB, RTF, AZW3, etc. All the below listed Epub to Mobi converter software come with user-friendly interface which make them easy to use. Some of the software have inbuilt reader which let you read eBooks in formats supported by these software. One of these mentioned software is a command prompt epub to mobi converter. This command prompt ebook converter makes it really easy to convert ebooks in no time. Go through the list in order to know more about them. You will also get to know how to convert epub to mobi using the listed freeware. I go with Calibre, as the process of ebook conversion is very easy with it. This freeware supports a number of popular eBook formats such as PDF, AZW3, DOCX, HTMLZ, RTF, ZIP, and more. This means in addition to Epub to Mobi conversion, you can carry out other conversions supported by this freeware. It is a type of an eBook manager where you can manage your eBooks by creating more than one library. You may also like some best free Epub Reader Software, PDF To TIFF Converter Software, and HTML to PDF Converter Software. EPUB to MOBI is a free Epub to Mobi converter sofware that lets you convert Epub files to Mobi format. To convert the files, first add Epub files to the software by clicking File menu, after that, click Convert option in the same menu. You can also use keyboard shortcuts for the same instead of opening the File menu. This software is actually a batch epub to mobi converter, as it can convert multiple Epub files into Mobi format at a time. The design of this freeware is very handy. Hence, you will not face any type of difficulty while using this software. Open all Epub files in this freeware one by one and click Convert option or simply press Ctrl+E key on your keyboard. Create a folder on your system and move or copy all Epub files into this folder. When you are done, open this folder in the software by Add Folder option in File menu and at last click Convert option. In addition, it displays file name and folder location in which the converted file is to be saved, file size, and output (converted) file name. NOTE: You can change the folder location but it doesn’t let you change the name of converted file. Calibre is a free eBook managing software that not only lets you lets you manage eBooks on your device but also can be used to convert Epub to Mobi format. Besides this format, you can also carry out conversion between PDF, AZW3, DOCX, HTMLZ, RTF, ZIP, and more files. You can create different virtual libraries and manage your eBooks in the software. Virtual libraries can be created on the basis of Authors, Tags, Publishers, Series and Saved searches. Begin by adding epub book(s) to the library of Calibre. When you are done adding ebooks, click Convert books button to begin the process of conversion. While converting eBooks, you will find many options in this software opened in different tabs separately to define conversion parameters. These tabs let you change Fonts, Texts, Layout, Styling, etc. 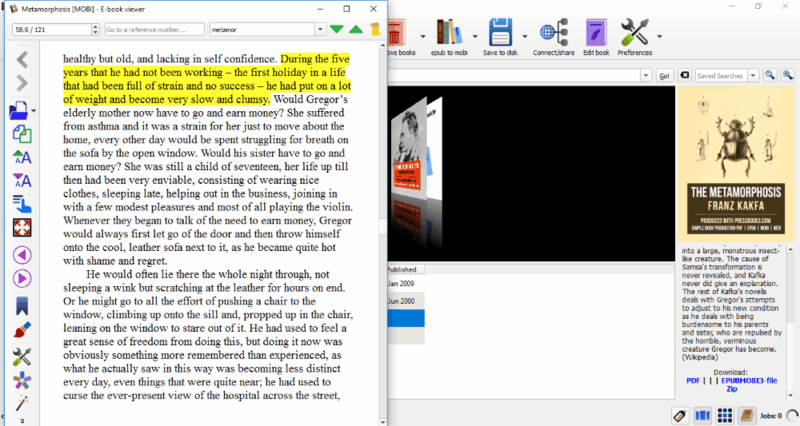 This Epub to Mobi converter lets you change font size, edit page setup and layout, edit Metadata of eBooks, view/read the books of any format in the software, bookmark any text and copy the bookmarked text to clipboard, etc. 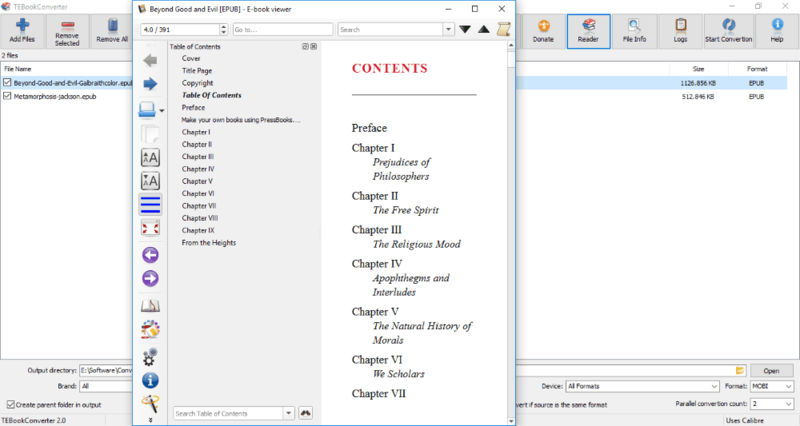 You can also edit the content of an eBook of any format using this freeware and save it to your computer. After epub to mobi conversion, you can share converted/edited eBooks on social media and iTunes. Calibre comes with the features that make it more than just a simple Epub to Mobi converter. The best part is that it offers all these features free of cost. Hamster is another free eBook converter that lets you convert epub to mobi. This free Epub to Mobi converter software is very handy and easy to use. It is a batch file converter that supports different document formats, like: TXT, PDF, Epub, Mobi, HTMLZ, PDB, RB, etc. You can convert a file supported by this freeware to any of these formats without any hassle. No need to worry about which type of device you have, as this 100% free eBook converter software which supports conversion of eBooks for about 200+ devices. With the device name, it also displays the ebook format supported by the device. Some of these devices are Amazon Kindle, iPad, iPhone 3, iPhone 4, iPod, FR Book, iRiver, Sony, Digma, Nook, BenQ, Kobo, Explay, CrossElec, Asus, etc. First, add your eBooks to the software from your system by clicking Add files button. Now you have to select the formats and platforms for which you want to convert eBooks and select the folder in which converted files are to be saved. Now, your eBook is just a click away. Click Convert button and get your eBook in your desired format. As simple as that. This is an easy to understand eBook converter, which can be used as Epub to Mobi converter, PDF to Mobi converter, etc. It supports more than 10 languages. Some of these are: English, Suomi, Francais, Deutsch, Italiano, Polski, Portuguese, Espanol, etc. TEBook Converter is another free eBook converter software, that can be used for epub to mobi conversion. Since, it supports different formats, it can be used as Epub to Mobi converter, Mobi to Epub converter, PDF to Mobi converter, TXT to RTF converter, etc. You can see the list of all formats supported by this free software easily. Some of these formats are Mobi, TXT, RTF, Epub, HTMLZ, SNB, TCR, ZIP, etc. Start by opening a file in the software, you can also open a folder containing files to convert for batch epub to mobi conversion. After that, select the format to which you want to convert your eBook, for example, if I want to convert epub file to Mobi format, then I select Mobi format from the list provided in this freeware. At last, click Start Conversion button. You can view the metadata by clicking File Info. It has inbuilt reader by which you can read eBooks of any formats supported by this free software. You can change the location for saving converted files. There is an option in the software, which lets you create a parent folder in the output directory. Print option is also available in the software. It supports eBook formats of devices of popular brands like: Amazon, Apple Asus, BenQ, Bq, Kobo, Onyx Boox, Sony, etc. It supports multiple languages like English, French, Russian, Spanish, German, Greek, etc. Document Converter is a free Epub to Mobi converter software which lets you convert Epub to Mobi format and vice versa. Its simple interface makes it easy to use and understand. Like other eBook converter software in this list, this freeware also supports multiple ebook formats. In addition to Epub to Mobi conversion, it supports various conversions in the following formats: PDF, DOC, DOCX, RTF, ODT, TXT, HTML, FB2, and more. You can convert any of these supported eBook formats into other formats. Start by opening eBooks in the software by click Add files button, you can open multiple files at a time for bulk epub to mobi conversion. It will take some time to open multiple files. When all files are opened in the software successfully, select the output format as mobi and click Convert Now! and you will get your eBooks in the desired format. It comes with format settings option which lets you edit format of an eBook. You can add a watermark to an eBook and change font style and font size of the watermark. You can also set privacy of your eBooks by setting a password. If you want to extract images from your eBooks, that option is also available in this free Epub to Mobi converter software, However, this feature didn’t work properly while I was testing it. Different types of skins are also available in this free Epub to Mobi converter. You can select the skin which you like. It has an inbuilt reader that lets you read eBooks. You can change the location to save converted files on your computer. It also lets you take a print out of eBooks. EPUB to Kindle Converter is another free Epub to Mobi converter software in our list. It comes with a user-friendly interface that makes it handy to use. Besides Epub to Mobi conversion, it processes conversion for many popular devices, like: Kindle, iPad, iPhone, iPod, Apple TV, Nook, Nook Color, Nook Tablet, Sony eReader, PDF, FBreader, Google Play Book, etc. You can also batch convert Epub to Mobi. To do this, add multiple files to the freeware by clicking Add button. After that, select output format as Mobi according to your device and click the Convert button and the software converts your files into the desired format automatically. It lets you change the output path where the converted files are being saved. You can also add multiple files in Favorites section of this software. This Epub to Mobi converter software is available in different languages, like: English, German, Italiano, Francais, Hungarian, Dutch, German, Catalan. 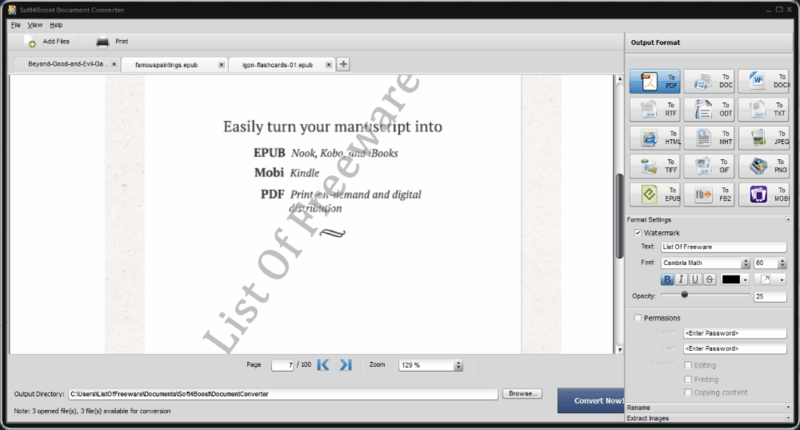 Mobi Batch is a lightweight and easy to use batch Epub to Mobi converter software. It only supports Epub to Mobi conversion, hence, you cannot open files of other formats in this software for conversion. Even reverse of Epub to Mobi is not supported. The benefit of this freeware is that you can batch convert Epub to Mobi format. To do this, open Epub files in the software and hit on Start button. It shows the location, size, and extension of the files that you have opened in this software. NOTE: You cannot change the location of destination folder for saving the converted files. This is a disadvantage of this free Epub to Mobi converter freeware. Kindlegen is a command line Epub to Mobi converter software. This free software is downloaded in the form of a Zip file. Extract that file at any on your system. This creates an application file with extension .exe file. Press Windows + R button on your keyboard. Then, type CMD in a window thus opened. Press enter. Open the folder containing application file (.exe file) and drag n drop that EXE file of Kindlegen software on CMD window. This will add the whole path of EXE file to the CMD prompt window. Press spacebar key on CMD prompt window once and drag n drop the Epub file (that you want to convert) from the folder where you have kept it on CMD window to automatically will add the whole path of that file. Press space, type –o, and press space again. Type the name that you want to give to the output file followed by its extension (.mobi). Press enter and get your converted file in the same folder. It supports Epub, HTML, and OPF formats for conversion. You can also select the output as DOC or Kindle Huffdic files by typing –c1 and –c2 respectively in lace of –o. It can display output messages in multiple languages, like: English, German, French, Italian, Spanish, Chinese, etc. Pressing enter key on your keyboard after performing second step will provide you all the information about this software. NOTE: This free Epub to Mobi converter does not process the batch conversion process.